Scary things happen when jewelers aren’t responsible with their inventory and supplies. Would you work for me for $150,000 a year? What if I told you I pay on Dec. 31 each year, only once a year? You’d expect from 2015 through 2017 to be paid three times for a total of $450,000. But after year one, I said, “I had a bad year, can you wait one more year?” Same thing in year two, and finally, in year three, you get a check for $150,000. Feel shorted? Expected to be paid every year? Profits from inventory are the same way. If you buy a ring for $500 in January 2015, you should expect it to sell by December and make a $500 profit at keystone. Do the same thing again in 2016 and 2017, and three years brings in $1,500 in cumulative profits. But if it takes three years to sell for $1,000 at full retail, you actually lost $1,000! Inventory in a jewelry store should generally sell once a year. For every item that did not and is now two years old, you’ll need another item of equal value to sell twice in a year to make up for the loss of profits by not selling the first item. Let me tell you two inventory dog “horror stories” to illustrate the point. The first story: I visited a store just last year that had five 8-millimeter wide 14K yellow gold herringbone chains. The store had had them since 1974! A $300 at-cost chain selling for $600 over 40 years, selling, reordering, selling, etc. should have given the owner a cumulative profit of $12,600. I told him to send them to a refiner and move on. In addition to not making him any money, customers have seen this outdated inventory since they were in high school at least! The second story: If a pair of earrings cost you $50, would you let it sit in the case for three years? No! So why would you allow a six-prong head that cost $50 sit in the shop for three years? I visited a store with a three-man shop. The jewelers were out to lunch, so I just looked over their benches. What I saw on just one bench was appalling. 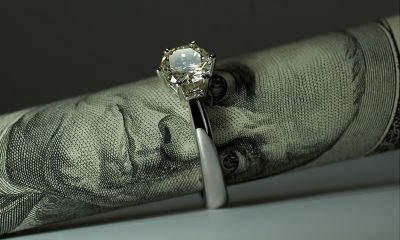 Jewelers don’t always have the right size gold to size a wide ring. A jeweler might take a 6-millimeter wide piece of stock and using a rolling mill make it 8 millimeters for a wide ring sizing. To make a ring one size larger requires a piece of gold less than 3 millimeters long. This jeweler had taken a 4-inch piece of sizing stock and instead of rolling out a quarter-inch for the wide ring, he had rolled out the whole darn 4-inch piece. It was now too thin and too wide to use for other sizings and it had been sitting on top of his bench for over a year. What else did I find on his bench? If he needed two heads, he ordered three “just in case” he melted one. I got a scale and cleaned off the top of his bench with all of the loose findings and sizing stock and weighed it. His bench had over $5,000 in wasted excess stock, never to be used by anyone. If it hasn’t been used within a year, melt or scrap it! I know one store owner who makes all jewelers clean off their benches of excess and dust nightly, and she stores it in a coffee can in the safe. This is all money that should be turning over yearly. Or can you afford to wait for your paycheck for three years? This article originally appeared in the October 2017 edition of INSTORE.